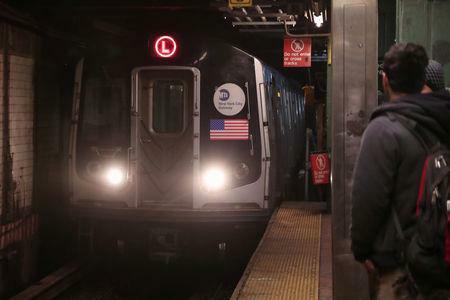 NEW YORK (Reuters) - More than two years after news that one of New York City's busiest subway lines would stop running between Manhattan and Brooklyn to allow for repairs, New York Governor Andrew Cuomo said on Thursday that the "L" train would keep rolling. The expected closure of the L train tunnel under the East River for at least 15 months had dismayed residents of the Brooklyn communities of Williamsburg, Bushwick and beyond. Many were bracing themselves for squeezing on to other already crowded lines or into promised new bus services. Some even moved out of their neighborhoods. Cuomo told a news conference that engineering experts from Cornell and Columbia universities had looked at the plans over the last few weeks drawn up by the Metropolitan Transportation Authority, the state agency that runs the subway, and found them needlessly disruptive. "The simple fact is you have roughly 250,000 people who would need another way to get to work," Cuomo said. Fernando Ferrer, the MTA's acting chairman, said the project will take 15 to 20 months to complete. "No 'L-pocalypse!" he added with a smile. Chloe Philips, 23, relies on the L train to get between her home in Bushwick and her job in sales at a technology company in Manhattan every day. Her lease is up in May and she was considering moving before Thursday's news. "Everyone's really relieved," she said, describing how the many Brooklyn residents who work at her company had exulted at the news in their internal online messaging chatrooms. "I was thinking how much money I was going to have to spend on Ubers going out." Under the new plan, work would take place only on nights and weekends, with trains running on limited service through one of the two tubes inside the tunnel, causing longer wait times. Asked whether he would promise that work would not exceed 20 months, Cuomo said: "I can't promise." The repairs were necessary to fix damage caused by Hurricane Sandy in 2012, one of the most devastating storms ever to hit the U.S. East Coast, which forced salt water inside old cracks and leaks in the century-old tunnel structure and corroded electrical switches and power lines. Scientists warn that climate change is making such storms increasingly frequent and intense. One of the biggest changes in the new plan is that the MTA will no longer remove and replace all 32,000 feet of benchwall, a gangway-like walkway that allows workers, or evacuating passengers, to walk along the edge of the tunnel. Instead, weakened parts of the benchwall will be patched up with strengthened, industrial-use plastic. The cables that currently run inside the benchwall will instead be suspended from racks higher up the tunnel wall. The Riders Alliance, an advocacy group for the city's transit users, called on the governor to release more details. "The governor's plan may or may not work," John Raskin, the alliance's director, said in a statement, "but you'll pardon transit riders for being skeptical that a last-minute Hail Mary idea cooked up over Christmas is better than what the MTA came up with over three years of extensive public input."